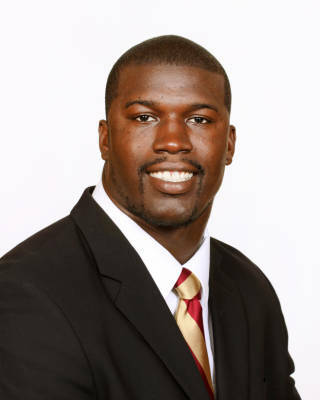 Senior stepped into the starting lineup when Brandon Jenkins suffered a season-ending injury in the opener and emerged as one of the nation’s top defensive ends…was leading the Seminoles in tackles with 80 when he suffered a season-ending injury in the regular season finale against Florida and still finished second on the team in total tackles (47 unassisted, 33 assisted)…recorded at least seven tackles in seven of 12 games…ranked second on the team in both tackles for loss (13.0) and sacks (11.0), as well as posted a team-leading nine quarterback hurries…teamed with Bjoern Werner to form one of the most productive defensive end tandems in the country…registered a career-high 11 tackles at Virginia Tech, then matched that total against Florida in the regular season finale…was on the cusp of becoming the first FSU defensive lineman to lead the `Noles in tackles since Reinard Wilson in 1996 when he injured his knee…had two or more sacks in consecutive games against Wake Forest and Clemson with a season-high 2.5 sacks against the Demon Deacons…recorded at least two tackles for loss in three games and ended his season tallying at least one tackle for loss in three straight games…helped Florida State’s defense lead the nation in yards allowed per play (3.86), rank second nationally in total defense (254.14 ypg) and rank in the top six nationally in scoring defense (14.71 ppg), rushing defense (92.29 ypg), pass defense (161.86 ypg), pass efficiency defense (95.43) and opponent three-and-outs (6.29 per game)…selected ACC Defensive Lineman of the Week a league-leading three times. Junior college transfer who became a prominent contributor behind Bjoern Werner at the left defensive end position…played in all 13 games and ranked second among defensive ends with 38 tackles, including 24 solo stops…ranked third on the team with 5.5 sacks and fifth in tackles for loss with eight…tied for 10th in the ACC in sacks (5.5) as FSU was the only school with three players in the top 10 in the conference…posted a season-high five tackles at Clemson…had 1.5 tackles for loss against both Wake Forest and Virginia…tallied four tackles three other times against ULM, Wake Forest and Maryland…capped off the season with four tackles and a sack in the win over Notre Dame in the Champs Sports Bowl…given one of two academic awards for the junior class at the annual team banquet and selected as co-recipient with Nigel Bradham of the Bill McGrotha Humanitarian Award. Enrolled early in January 2011 at Florida State…one of the nation’s top overall prospects out of junior college (No. 1 by Rivals.com; No. 5 by Scout.com) and the No. 1 JUCO defensive end prospect…four-star recruit according to Rivals.com and five-star recruit according to Scout.com…rated a five-star recruit by 247Sports…No. 1 on the SuperPrep JUCO 100…racked up 26 sacks in his two years at Butler Community College, including 16 in 2010, which led the NJCAA…named 2010 First Team NJCAA All-American…led team to a final No. 2 ranking in the NJCAA and an appearance in the NJCAA national title game as Butler finished its season 11-1 while also winning the Jayhawk Conference and Region VI championships…an All-Jayhawk Conference First Team selection…Region VI Defensive Player of the Year…as a sophomore, led his team with 119 tackles including 29 for a loss and 16 sacks…also forced three fumbles, recovered five others, recorded 15 quarterback hurries and a pass breakup…his 29 tackles for loss rank fourth in a single season…started every game at weakside defensive end as a freshman in 2009 and led the Grizzlies with 90 tackles…finished second on the team with 20 tackles for loss and 10 sacks…prepped at Cincinnati’s Taft High School where he was coached by Mike Martin…regarded as one of the top prospects in the Midwest prior to signing a letter of intent with Illinois out of high school…picked Florida State from a wide array of offers including Alabama, Ohio State and Georgia…also goes by “Tank”…February 18, 1989.